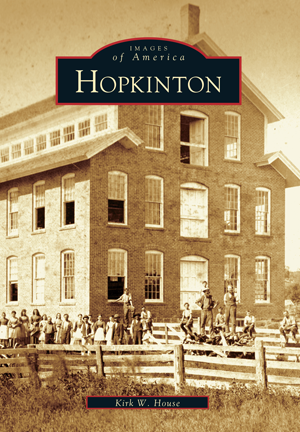 Hopkinton has always been a rural town, but it grew up on pioneer industry. The mills on Wood River and other waterways form only part of this collection of Hopkinton images. You will also see town residents putting on plays, going to Camp Yawgoog by wagon, and fishing on Yawgoog Pond. Here is Hopkinton from the dawn of photography to the middle of the twentieth century: stone walls and farmsteads, horse-drawn buggies and early autos, and the fondly remembered Wood River Branch Railroad. Kirk W. House grew up on Locustville Pond, went to Hope Valley School, haunted Camp Yawgoog, and graduated from Chariho High School. Well known as an aviation historian, he is now a writer living in western New York. House, a former teacher and museum director, has coauthored four Arcadia books. He is a member of the Hopkinton Historical Association and an alumnus of Rhode Island College.